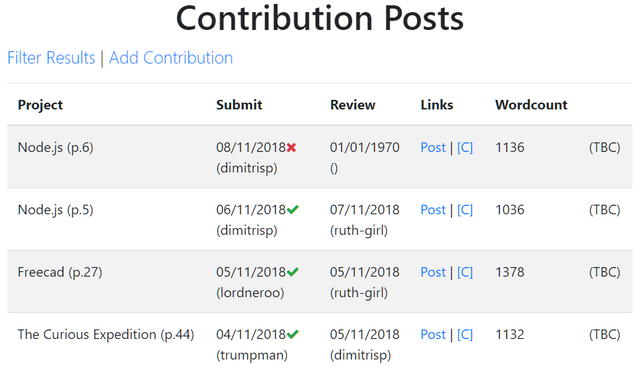 This week, we have 61 Contributions. In the translation category, it is important that we monitor the contributions submitted by the different language teams as translators work together in teams. 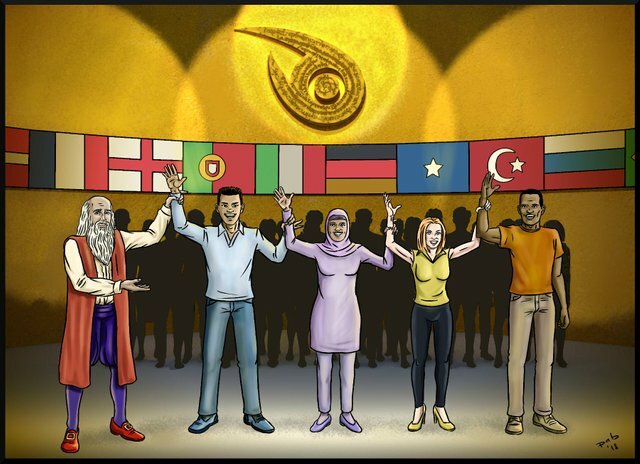 Therefore, the statistics and graphs will not show the contributions of the 101 individual translators but will display the 17 language teams instead. 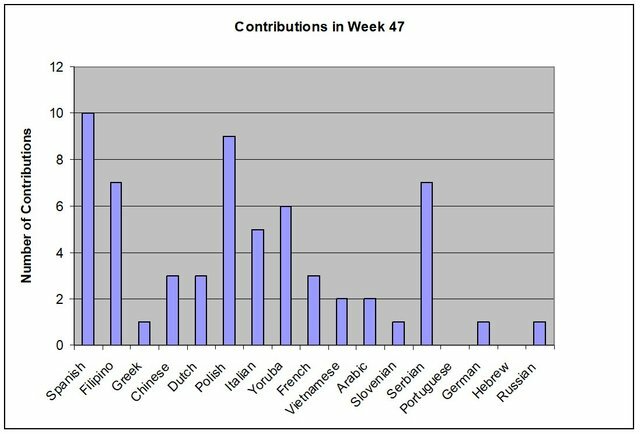 The following chart shows the distribution of contributions of the 17 different language teams. There are no contributions from Portuguese and Hebrew teams. 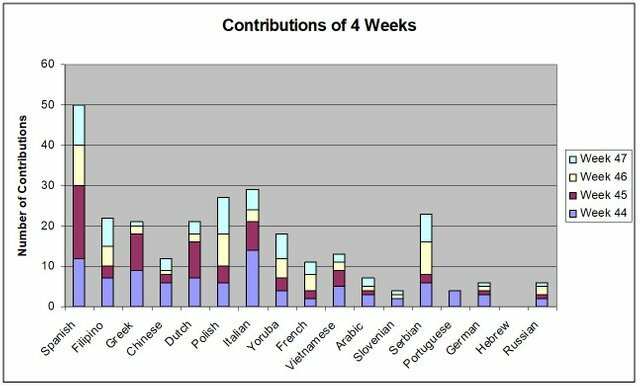 The following table shows the number of contributions in the different language teams for 4 weeks. 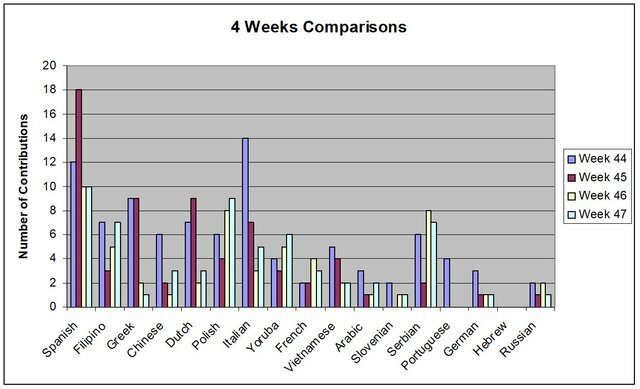 There are 4 color bars for each language teams with each bar representing the 4 different weeks. It is important that we measure the language team activities not just by one week but to see their monthly overall performance. There is no growth in Portuguese and Hebrew teams. For the scoring distribution, we have 25 moderators, so I need to group the scoring into language teams so that you can see the analysis clearer in the distribution of scoring. The X-axis is not able to list out all the languages for each score as it will get very messy. The following statistics will give the detail that is lacking in the chart. All contributions got voted this week. This week's staff pick is from the French team. It received a score of 73. ReactOS is a free and open-sourced operating system based on the Windows NT architecture. It provides support for the applications that already exists, and an alternative to the current operating systems that dominates the market. This is the translator's 6th contribution to the ReactOS project. From his post, you can see that he did an accurate translation this time as he learned from the mistakes made in the 5th contribution. He was also careful in making sure the translation was correct by doing research in understanding the the context of the sentences before determining the correct translation of each term. The translator works well with the advice given by the moderator @leyt. The Aristotle app is ongoing in the development by the Greek team. You can follow up this project in this Gitub Link. The app is going to be a great tool for our translators. The tool aims to become an LM's personal assistant as they do the moderating work. The tool will have a more uniformed and centralized method to keep track of translators progress and tasks. I hope you can see the power of this app. This will certainly help the DaVinci Team to keep track of the activities of all the 101 translators easily. Thank you @dimitrisp and the Greek team for your innovative app. This week, 2 LMs requested to step down from the LM position to the role of translator. We are now looking for LMs in German and Hebrew teams. The Portuguese team has been inactive for 3 weeks. We are looking for a new LM for the Portuguese team. This week, the @DaVinci.witness team is working on the new questionnaire. 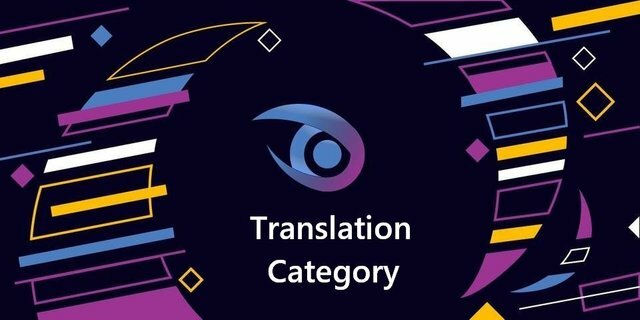 Please comment and give your feedback as we work together to make the Translation Category great. Hello @rosatravels, thank you for the comprehensive report. As always, you covered every necessary detail of the Translations category. Well done! Thanks tykee for taking the time to review. Have a good weekend.